It’s been 25 years to the day since the standoff began between the federal government and the Branch Davidians in Waco, Texas. What began as the longest shoot-out in American law-enforcement history turned into a weeks-long siege that ended 51 days later with 75 people dead, many of them women and children. It also left a lot of questions. 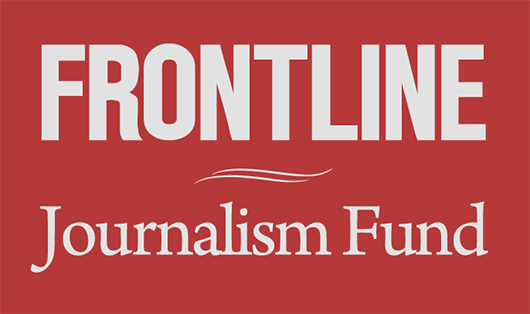 In 1995, FRONTLINE obtained access to the Waco files — 7,000 government photographs, wiretaps and hundreds of hours of telephone negotiation tapes that had never been publicly revealed. The collection, along with interviews by FRONTLINE with some of the main actors involved, offered new insight into the Davidians, their compound standoff, and its fiery conclusion. Nobody knows who shot first. 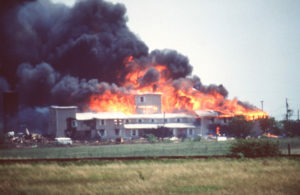 Gunfire broke out on the compound when ATF agents arrived with arrest and search warrants against David Koresh and the Branch Davidian compound, based on evidence that the Davidians were illegally stockpiling weapons. How did the shootout begin? It still isn’t clear. But amid the gunfire, Koresh called 911 to report the shooting — and to preach. DAVID KORESH: This is Dave Koresh. 911 OPERATOR: This is who, sir? DAVID KORESH: David Koresh, Mount Carmel Center. We’re being shot all up out here. 911 OPERATOR: Okay. Where are you? DAVID KORESH: Where am I? I’m at Mount Carmel Center! 911 OPERATOR: Okay, hang on just a second. DEPUTY SHERIFF: Yeah, this is Lynch [sp?]. Then Koresh, in the midst of the gunfire, began to preach from the Bible. DAVID KORESH: There are seven seals. David Koresh wasn’t his real name. It’s actually Vernon Wayne Howell. Born in 1959, Koresh grew up in Houston, Texas, the son of a single mother. Koresh told the FBI in their late-night chats during the standoff that he was a lonely child, teased by other kids who called him “Vernie.” He struggled in school, but was drawn to the Bible, large portions of which he memorized despite being dyslexic. Koresh joined the Branch Davidians at age 22, and became involved with the sect’s prophetess, Lois Roden. After she died, Koresh challenged Lois’ son George for control, showing up with seven heavily armed followers at the Waco compound. Roden ended up shot in the head and chest, and Koresh and his men were charged with attempted murder. The seven were acquitted; a mistrial was declared for Koresh, who told the jury they’d aimed at a tree. Then, he assumed leadership of the Branch Davidians. That’s when he changed his name to David Koresh — “for publicity and business purposes,” according to court documents. What did his new last name mean? He told one FBI agent at first that it meant death, and then that it was a surname from God. Koresh told his followers he was the Messiah — but he may not have believed it himself. FBI agents told FRONTLINE that any Branch Davidians who wanted to leave the compound had to undergo an “exit interview” with Koresh, who would remind the wayward follower that to abandon him was to reject salvation. The Davidians thought the Devil rules the world. The Davidians were well-educated. Koresh’s deputy had a theology degree, and another was an attorney. So what did they believe? The Davidians believed that the Bible is the literal word of God, and that the prophecies in the book will be fulfilled, said Clive Doyle, a Branch Davidian who spoke to FRONTLINE in 1995 about life on the compound before the raid and the group’s beliefs. One of the more important: the Bible’s Book of Revelation, which they believed details the end of the world. The Davidians believed that at that time, God would judge everyone, punishing the sinners and rewarding the good in a special kingdom. “We don’t perhaps use the same terminology or get into all the conspiracy theories that some people that promote that idea promote,” Doyle said. The FBI slipped listening bugs into milk cartons they sent into the compound. Koresh had previously allowed a few children to leave the compound. So the FBI offered to deliver milk to the compound if more were released. Koresh refused the deal. But the FBI sent in milk anyway, and got something else from the delivery: They planted listening bugs in the milk cartons and their styrofoam containers. DAVID KORESH: [surveillance tape] Rachel! DAVID KORESH: Keep those children under control. They won’t be singing that today. DAVID KORESH: [surveillance tape] Let me send some guys up there and blow their heads off. The bugs also allowed the agents to get a read on their reaction to an initial face-to-face meeting between Koresh’s deputy, Steve Schneider, and FBI negotiator Byron Sage. The breakthrough didn’t last long. Koresh didn’t permit any more in-person meetings. Two FBI teams clashed over how to handle Koresh, and it spilled over into name-calling. The FBI had two teams working to end the standoff: The negotiators, who tried to establish a relationship with Koresh and the other Davidians, and the Hostage Rescue Team, which handled the tactical maneuvers. The two sides were often at odds. Negotiators felt hamstrung by a hostage rescue team that made aggressive moves — blaring music, crushing Davidians’ cars and a guard shack — in the midst of delicate discussions with Koresh. The hostage teams, meanwhile, felt the negotiators should have pressured the Davidians by denying them food or water, or cutting the power, according to Barry Higginbotham, a member of the FBI hostage rescue team at Waco, who spoke to FRONTLINE in 1995. BYRON SAGE, FBI negotiator and supervisory senior resident agent: On occasions, I made a number of trips up to the tactical sites located right out in front of the compound. There was one time when there was a notation on one of the portable outhouses up front that said, “Sage is a Davidian,” obviously written by one of the tactical guys. That would be very symbolic of the frustration. There was a high level of frustration. Koresh repeatedly told investigators he wasn’t planning a mass suicide. Many in the FBI believed him. Convinced that Koresh might eventually surrender, the negotiators kept talking to Koresh, offering him opportunities to broadcast his message on the radio and television. The FBI finally determined to tear gas the compound only when they learned that the Davidians had supplies to hunker down for as long as a year. 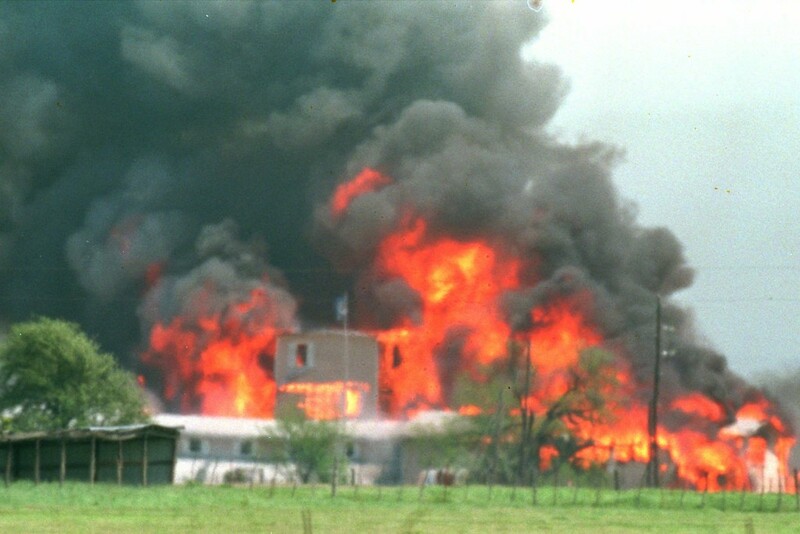 The FBI told Attorney General Janet Reno that children were being abused at Waco, even though it wasn’t true. We had had reports that they had been sexually abused, that babies had actually been beaten. I asked when I first heard that for them to verify it and, again, that was the report that was brought back. It wasn’t true, and the FBI knew it. So who told her? William Sessions, the FBI director at the time, told FRONTLINE he wasn’t the one. But someone at the FBI did, according to documents FRONTLINE uncovered. It’s just not clear who. Ultimately, Reno approved the gas plan. Agents began spraying tear gas into the compound the morning of April 19, 1993. The Davidians started the lethal fires that day. About six hours after the tear gassing began, flames simultaneously erupted at three separate locations on the compound. Audio recorded by the milk-carton bugs suggests the Davidians started the fires, acting on orders from Koresh. 1st DAVIDIAN: [surveillance tape] Start the fire? 2nd DAVIDIAN: Got some fuel around here? PETER BOYER: The audio bug tapes from the morning of the fire were the critical evidence. 4th DAVIDIAN: [surveillance tape] Did you pour it yet? 4th DAVIDIAN: Did you pour it yet? 5th DAVIDIAN: I haven’t yet. 6th DAVIDIAN: David said pour it, right? 5th DAVIDIAN: Did he? Do you want it poured? 6th DAVIDIAN: Come on. Let’s pour it. 5th DAVIDIAN: Do you want it poured already? 7th DAVIDIAN: We want some fuel. 5th DAVIDIAN: I’ve got some here. 8th DAVIDIAN: We should have gotten some more hay in here. Most of the Davidians died of smoke inhalation after the fire began. The compound didn’t cool down until a week later. Investigators found 75 bodies. Only nine of the Davidians had escaped the fire. All of the remaining 25 children perished. Koresh and his deputy, Steve Schneider, were found with fatal wounds to their heads, suggesting suicide, or murder-suicide, according to Dr. Nizam Peerwani, the chief medical examiner for Tarrant County in Northcentral Texas who spoke to FRONTLINE in 1995. Peerwani said that 50 people had died of smoke inhalation. Most of the women and children were found in a concrete bunker full of guns and ammunition. For more, check out FRONTLINE’s 1995 website for Waco: The Inside Story, which contains transcripts of the FBI negotiations, interview excerpts, photos and a full chronology of the Waco siege. Editor’s Note: This story was updated on Feb. 28, 2018 to mark the 25th anniversary of Waco. It was originally published on the 20th anniversary of the standoff in 2013.